Recently you may have read the exciting news that a 2.5 year old girl has been cured of HIV. What struck our attention when reading the articles was the fact that this girl is reported to be the second person in history to have been cured of HIV. Here is how some of the big news agencies are reporting it. What about all those supposedly healed of HIV at SCOAN? On their website currently they have 9 testimony videos of people claiming they were cured of HIV at SCOAN. Multiple identical news articles (usually proof that it is the work of SCOAN PR rather than genuine a journalistic piece) on African news sites state that “HUNDREDS of people from across Africa have said they were healed of HIV/AIDS after visiting Nigerian Prophet TB Joshua” (e.g. here, here and here). Whatever the real number of people SCOAN claim have been healed, it is a lot more than what some of the biggest and most respected news agencies in the world are aware of. Proving that someone once had HIV and no longer does is a fairly simple process. “Hundreds” of people being healed of HIV is world-shaking, front page news. If people really were being healed at SCOAN they would have flown in world-renowned experts in the virus to validate their claims instead of showing dubious ‘before and after’ medical certificates (who knows whether they are genuine or if the doctor signing them was bribed?). HIV is an epidemic in Africa. False healing only spreads it faster and more widely. This must be stopped. If SCOAN are to continue claiming people are healed of HIV, they should open their doors to any researcher who wants to come and investigate and validate their claims, in fact they should actively encourage it and publish the findings in full. The fact that they have not done this is strong evidence that the claims would not stand up to this kind of scrutiny. For this reason we have no choice but to assume it is all a lie. It is too important an issue to sit on the fence. If you are a supporter of SCOAN, you should encourage this call for transparent and independent research into their claims. If the claims are true, TB Joshua will become the most well known and celebrated minister on this planet, if the claims are not true – anyone involved in upholding them is contributing to the death and misery of many. TB Joshua is a controversial Nigerian pastor and prophet. He has a huge following within Nigeria, and a fast growing one internationally (mainly through his satellite TV channel Emmanuel TV). Below we have summarised some of the most concerning issues about him. For a number of years there have been an increasing number of allegations made about TB Joshua sexually abusing young girls at his church. The church has never investigated or addressed these serious allegations. How can the abuse allegations be verified? Besides the deaths reported in a piece recently broadcast on the BBC, the authors of this site are aware of 4 other deaths under similar circumstances (not AIDS, but where they were told to stop medication and subsequently died). In 2005, after a large crusade at Botswanan National stadium, President Festus Mogae released a statement urging patients who had visited TB Joshua for healing, including those on the antiretroviral (ARV) therapy, to continue taking their medication. The fact the president had to take this unusual step lends enormous credence to this BBC story. We recently told the story of Judith, a lady suffering from diabetes who was told by TB Joshua that she was healed, and to stop taking her medication. 2 days later she was in a coma. The comments on the story from SCOAN supporters were revealing. Rather than denying the truthfulness of her story they scolded her for the lack of faith that got her into this almost deadly predicament. Sky News have conducted an undercover report which confirms the suspicions the BBC article raised, yes SCOAN does tell AIDS victims to quit their medication. 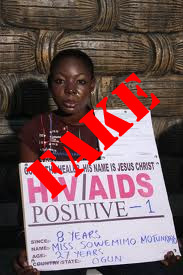 One reliable source we have spoken to tells us that of all those who have allegedly been healed of AIDS (i.e. they have had it medically verified), every single one is Nigerian. This does not represent the diversity of people who come to him for healing, but given the extent of corruption in Nigeria, it doesn’t take much to join the dots here. Previous supporters of TB Joshua have spoken out on this site about some of the trickery used in the portrayal of these so called “miracles”. As mentioned in a recent BBC article, he widely distributes his special brand of “anointing water” which they claim is for “good health and breakthrough in all areas of your life and for the salvation of your soul“. Most Christians will instantly realise what a blasphemous claim the final part of that statement is! SCOAN adamently state that it is free, but this seems to be a misleading statement. It’s free in that it doesn’t have a price tag on it, but you don’t get it for nothing. Ex disciple Gareth explains more in this comment. A previous article on this site compared testimonies of past TB Joshua disciples with the 14 cult identifying criteria compiled by the International Cultic Studies Association. Not suprisingly, they closely match every single criteria. 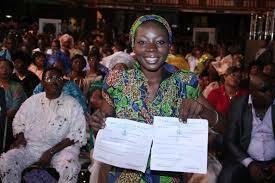 Like the Scientologists, SCOAN record video confessions of most new disciples and even visitors to the church. These thousands of videos are kept on archive as future blackmail material should any of their supporters turn against them. They have already attempted to blackmail this site on one occasion. If this isn’t evidence of them having something sinister to hide, we don’t know what is! He teaches that as a “man of God”, all his words are the infallible words of God. Not suprisingly this leads to some extremely strange beliefs amongst his followers. Some believe that future generations will be reading TB Joshua’s words in the way todays generation of Christians read the bible. The authors behind this site have friends and family who are involved with SCOAN. We have seen the devastation it has wrought on these people’s lives. We hope that the information given here helps stop others from suffering the same fate. The best way you can help is to link to this page and increase the exposure of this content. You can use the share button below to add it to your social network site.